Blocking off time allows you to set aside stretches of time on the calendar that aren't tracked as bookings. This is useful for maintenance or construction periods, owner stays, etc. 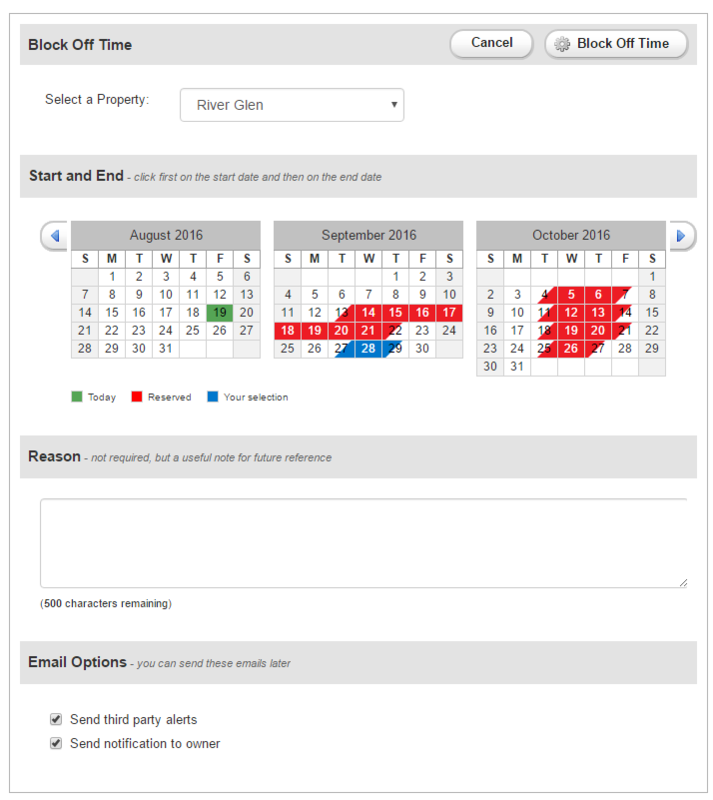 In the resulting screen, you'll be able to select the property to block, choose dates, and enter notes about the block if needed. You can also send emails notifying interested parties such as housekeeping about the block. One thing to consider when making a block is that OwnerRez calculates bookings and blocks based on nights, not days, because that's how things tend to work with guests. Even for a single day block, you still have to pick both arrival and departure to choose which night(s) to block off. For example, if you wanted to block the day of the 22nd, you've got a couple of options based on which nights you want to still allow guests to arrive. Block 21st-22nd, which will block the night before but allow people to arrive on the 22nd. Block 22nd-23rd, which will block the night of, but allow people to depart on the 22nd. Block 21st-23rd, which will block off the entire day as well as the night before and after.